The country of Russia (in the native language, Rossiiskaya Federatsiya) is categorized as a federal republic; the country has a both a presidential and parliamentary form of political system, just like France, Finland, and Poland. The two most powerful positions in the Russian government are that of the president and the prime minister. Both holders of these offices also sit on Russia’s Security Council. The president of Russia is considered the head of the state and the government, while the prime minister serves as his deputy (the equivalent of a Vice President in the United States of America). Both the president and the prime minister are heads of the executive branch, and they share control over the government bureaucracy. They are co-heads of the government, and they both belong to the same political party. By extension, the same political party remains in power. The president of Russia has a central role in the government’s political system and is granted several roles, duties, and responsibilities. The president mainly influences the executive branch’s activities. He also appoints the prime minister and other members of the government, chairs the cabinet’s meetings, and gives orders to his deputy and other members regarding governance. He can also revoke any act or law passed by the government. The president’s deputy, the prime minister, also has duties of his own. Distributes duties among the members of government. Another difference between the president and the prime minister is that a president is elected by the people via an election, while the prime minister is only appointed by the president. Depending on the situation, the president can also dismiss the prime minister and other members of the government. The president has the final say in all government activities and all its members. The president remains the most powerful man in the Russian government and holds the main office (which is the presidency). As his deputy, the prime minister occupies the second highest office in the government. Another difference between the two offices is that the office of the prime minister of Russia was created many years before the office of the president. The prime minister’s office was created in 1905, while the office of the president was created in 1991, with Boris Yelstin as the first president. The president and his prime minister also have different residences. The president stays at the Moscow Kremlin, while the Prime Minister has his quarters and offices at the White House Moscow. The president of Russia holds the highest political office in the government, while the prime minister hold the second highest office. The president is elected by the Russian people, while the prime minister is appointed by the president, just like other applicable offices in the government. The president is the head of the state and the government; the prime minister is a co-head of the government but not of the state. The president has a central role in the Russian political system, while the Prime minister acts only as a chief administrator of the government. The president has the power to appoint and dismiss the prime minister. The prime minister doesn’t have this privilege. The office of the prime minister is older than that of the president; the former was established in 1905, six years before the office of the president was created. Celine. "Difference Between Prime Minister and President in Russia." DifferenceBetween.net. September 28, 2017 < http://www.differencebetween.net/miscellaneous/politics/difference-between-prime-minister-and-president-in-russia/ >. Great explanation, thanks! So the President is like the Captain of the ship and the Prime Minister is like the Chief Executive Officer who runs the ship according the policies and instructions set down by the Captain. MMM…well, not exactly if you are talking about the US navy. The CO can actually take measures to remove the captain in the navy though such ever happening is unprecedented I think. Basically, they created the position of the president as Dictator. He is charge of EVERYTHING. He can appoint anyone and remove anyone. He can remove any law he doesn’t like. He is head of state and government. Heck, the president can even use the prime minister as his emissary to the government (not sure this would be in good practice as it pertains to support though – because they still have elections – though…I am not going to even get involved in talking about that whole mess). Are you sure this is correct? 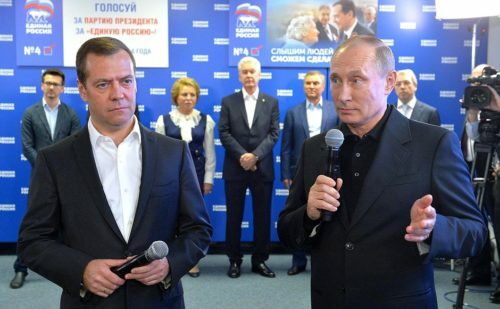 Because from what I read, the PM of Russia Dmitry Medvedev was the one that brought back Putin to be President. In addition, he is the one ruling the country as the PM and looks like he has more power than Putin. yea… I’m pretty sure this is incorrect. I’m just looking into this but everything (2 other sites with more cred then here) state multiple discrepancies from this article…. especially the comparison of President /VP and the notion the Russian Presidency is part of their executive branch… where is the source? author? Needs to be flagged..
i need to contact mr president of russia very urgently.